The only part of this recipe where measure matters is for the rice and even there I have not found the need to be too precise. Perfect rice is perfect for you: add more water, less water, more salt, oil, a bay leaf, a chopped onion. In time, you’ll have a lot of perfect rice. I like baked brown rice— it comes out with a little more bite left to it. This also works well if you are roasting the asparagus since you can make double use of the heat your oven worked hard to get. Everything else is subject to the whims of whoever is making it. I do try to make extra rice since it is so useful for so many things— even plain for a quick snack. But sometimes everyone is really hungry and the only thing left is a small prize of rice scrapings for whoever is cleaning the dishes. You could also make this with quinoa, couscous, or some sort of small pasta. If I am using medium to thick asparagus, I roast them. These seem to really like being roasted and will thank you with a smoky sweet flavor. I cut them into bite-size pieces, discarding any hard ends, toss them with olive oil and flaked sea salt and spread them out on a baking sheet in a single layer, giving them a little space. If I have the thin asparagus, I trim their woody ends, leave them whole and drop them into boiling, salted water for two minutes at most and then run them under a bit of cold water and onto a kitchen towel. Then they would be strong enough to merrily jut out of the bowl and you could eat them by hand, dipping them in the sauce as you go. It’s always fun to use your fingers. I have been seeking out wild Sockeye, King, or Coho salmon because they have the deepest color. I’m not sure what goes on with farmed salmon, but they look like I do after a long winter—pale. Some even have natural color added. Something added is never natural. What color was it before? I would rather have a smaller piece of a salmon that lived the salmon life. And here you don’t need a big piece. Start with the baked brown rice. Make sure there is room in the oven for the rice (I bake this in a 11 cup square covered Anchor Hocking baking dish) and the baking sheet of asparagus. Get the oven going at 375°. This is my big, hoping for leftovers portion, but you can cut it in half or thirds: 2 1/4 cups medium grain brown rice, 3/4 teaspoon table salt, 3 1/3 cups water, 2 tablespoons of olive oil, 9 x 13 glass baking dish with foil to cover or a similar capacity glass baking dish with a glass lid. This will spare the foil. Bring water to a boil in a pot or microwave in a four cup Pyrex measuring cup or other microwave safe bowl. In baking dish combine rice and salt. When water is boiling, add it to the rice. Stir in the olive oil and cover. Bake for about an hour. Put the bowls on the stove to warm up. Once the rice is in, cut up the asparagus. I usually cut them on the bias just because I like the way they look and it doesn’t take any more time here. Discard (or compost) any really woody ends. Toss with a little olive oil and flaked sea salt. Spread on a baking sheet and put them in the oven with the rice for the last half hour. When you take the rice out, move them up to the top rack and broil for a few minutes to get some nice brown spots going. After the asparagus goes in, make the sauce. Mix the greek yogurt or any plain yogurt you like or have around, or even mayonnaise, with a handfuls of fresh minced chives and parsley. You can also try adding mint. Or maybe some tarragon could work. Squeeze in enough lemon juice to get the taste and consistency you like and add a dash of salt and a little fresh ground pepper. Set it aside to let the flavor come together. When the rice is about ten or so minutes from done, set a pan or a griddle on the stove and let it get good and hot. Prepare your salmon: rinse, dry, remove any bones, season with a little table salt and ground or fresh cracked pepper. Sear the flesh side first, turning after it releases from the pan and has a little crust to it. I don’t find that I need any oil here, I just have to wait for the pan to let it go after a few minutes. Sear the other side a few minutes and let the skin crisp up, someone at the table will probably love a side dish of crispy salmon skins. Turn the heat down and let it finish cooking, anywhere from 3 to 5 minutes or so depending on how thick it is and how done you want it to be. While the salmon is finishing, remove the rice from the oven, move the asparagus to the top shelf and set the oven on broil. Is the salmon done? Sneak a peek with a sharp knife if you’re not sure. I always do this because I’m never sure. Or better yet— see if an instant read thermometer registers 145º. It’s ready. Remove the skins from the salmon if you want. Or leave them on. Assemble your little bowl with as much or as little as you want. Top with a few chive batons if you’re in the mood. Why a bowl? You can use any kind of dish, but I like a bowl. I like to cup my hand around the bowl while I’m eating to share a little of the food’s warmth with my hands. The best part is at the end: holding the bowl helps you get every last bit out. For olive oil, I use Columela— it has a sort of spicy flavor, for sea salt flakes, I use Maldon, and for pepper, I use the Tellicherry variety. I use table salt for anything mixed in or cooked and save the sea salt flakes for finishing or roasting. Using these ingredients adds a little extra flavor to the dish and they’re getting much easier to find now. 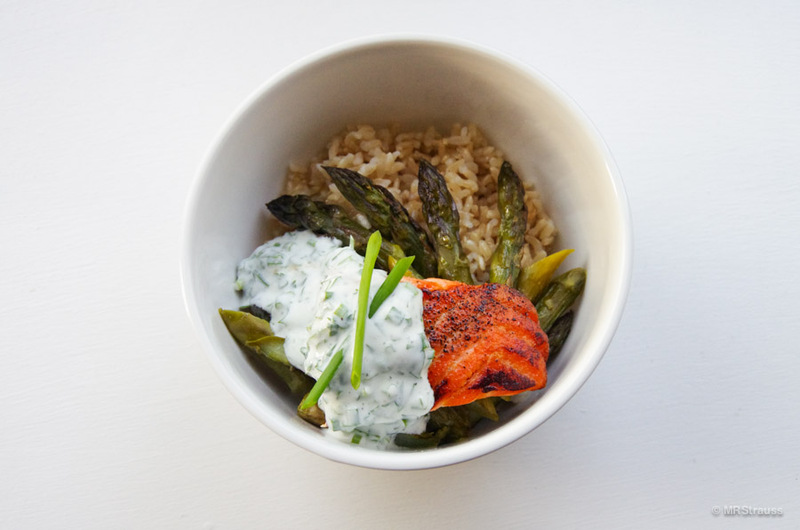 This entry was posted in Bentosh and tagged Asparagus, Bentosh, Brown Rice, Salmon on April 29, 2014 by mrstrauss.